Ask CF: How Do I Dress for Two Jobs in One Day? Strike the right balance between playful and professional. Next week I will start two jobs. In the morning I’ll be doing an internship as a psychologist for old people with cognitive deficits, and in the afternoons I’ll be working as a child psychologist. Therefore, I need outfits that look both polished and mature (since I am very young, I don’t want patients looking at me as a child and doubting my experience), and at the same time outfits that are comfortable enough to spend the whole afternoon on the floor with little children. I have no clue about how to manage these two situations. Hoping that you can save me! First off, congrats on landing such amazing jobs; I’m sure you’ll be helping to make a big difference in patients’ lives! That being said, dressing for two different jobs — especially ones that require you to deal with people of such different ages and backgrounds — can be challenging. 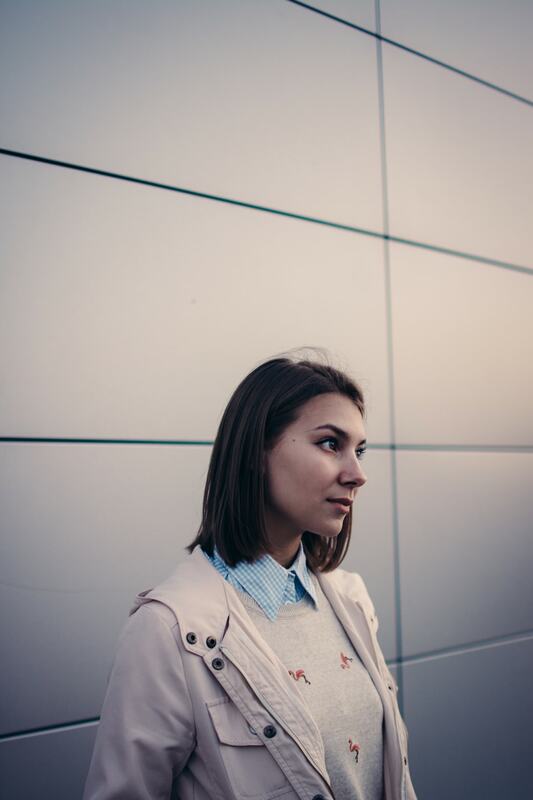 However, the good news is you can totally make this work: All you need to do is have a few outfit formulas handy that combine elements of put-together-ness and maturity, as well as youthfulness and playfulness — while still maintaining an air of professionalism. This might sound difficult to do at first, but don’t worry; once you get the hang of it, it’ll become second-nature. So, keep scrolling to see the looks that I’ve put together for you! 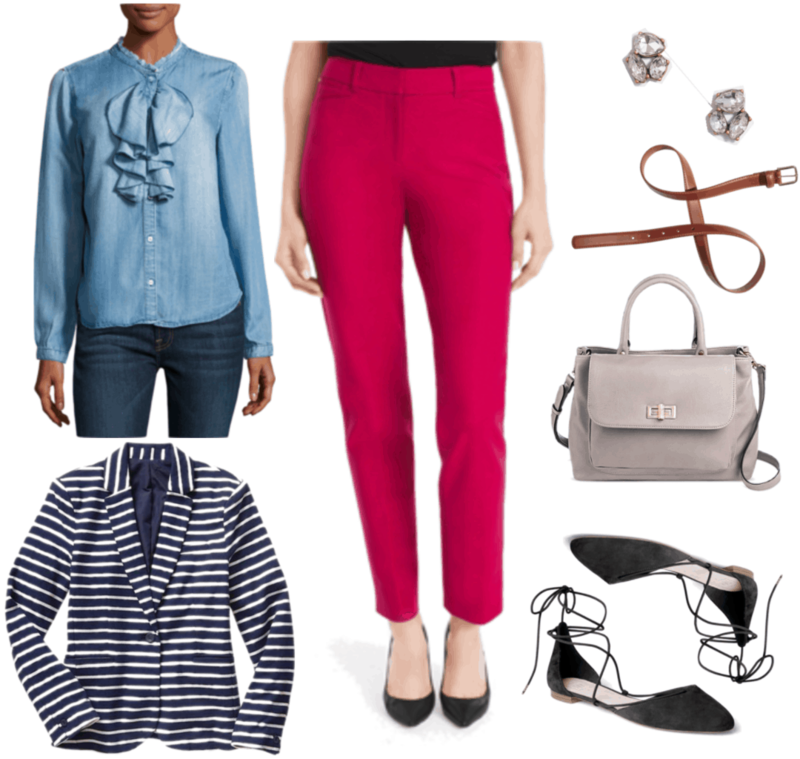 I put together this outfit to show that the typical business-casual combination of a blouse, a cardigan, chinos, and flats doesn’t have to be boring. 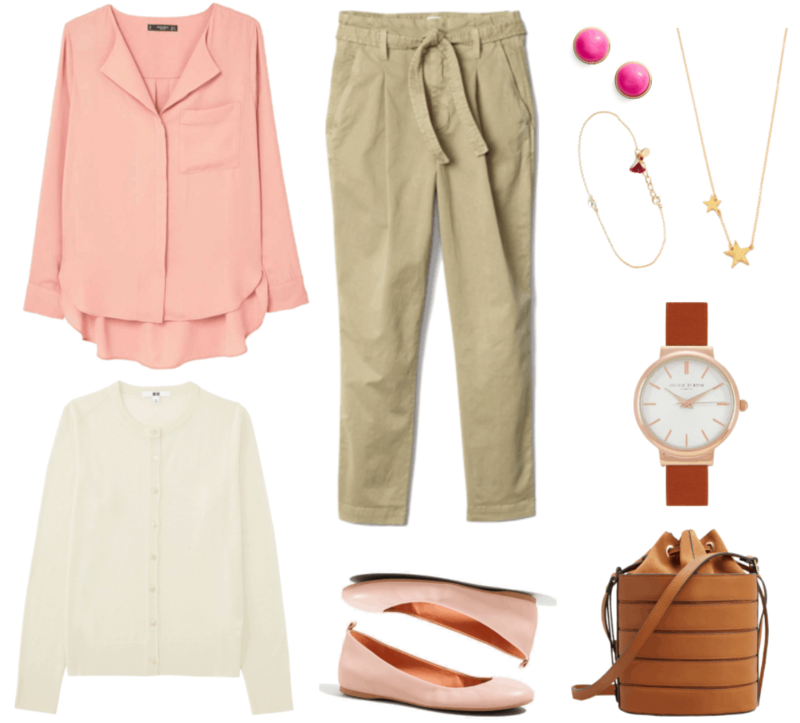 When you choose a cohesive color scheme — like the pink/beige/off-white/brown one of this outfit, your look is upgraded from dull to pretty! Start off by choosing a blouse in a bright, cheerful color, such as salmon pink; then, put on a pair of chinos in a neutral shade that will offset the brightness of the blouse. I love these Gap ones in particular because of their flattering and professional vintage-inspired fit. Next, throw on a classic cardigan in a different neutral hue that won’t clash with the blouse and pants; off-white is a safe bet that is also more flattering on most skin tones than its stark white counterpart. When it comes to jewelry, it’s best to keep things on the smaller side: Some fun pink studs, a cool star necklace, and a cute solitaire bracelet work well with each other and with the outfit, while the classic watch brings a bit more seriousness to the look. 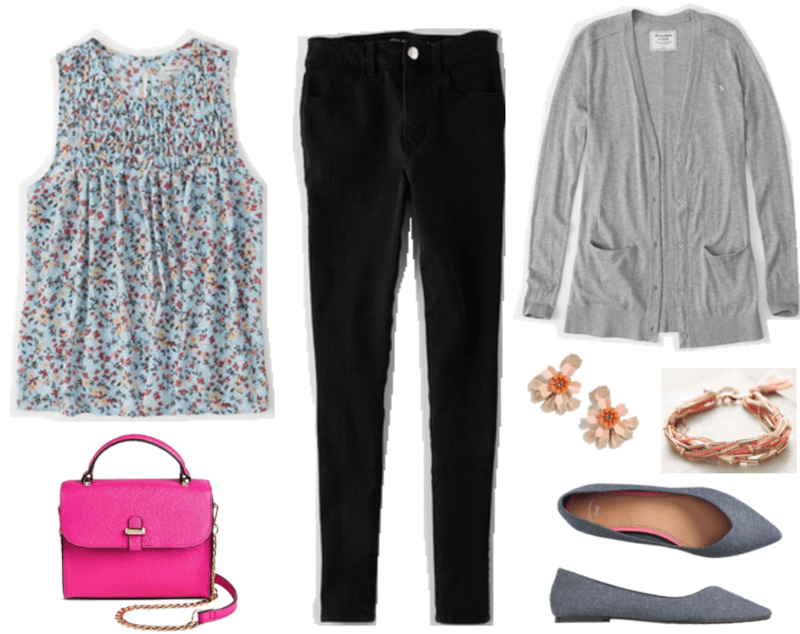 Finally, grab a trendy-but-classy bucket bag and some pretty pale pink ballet flats to round out the look. If you’re looking for something slightly more dressed up, then this is the look for you! 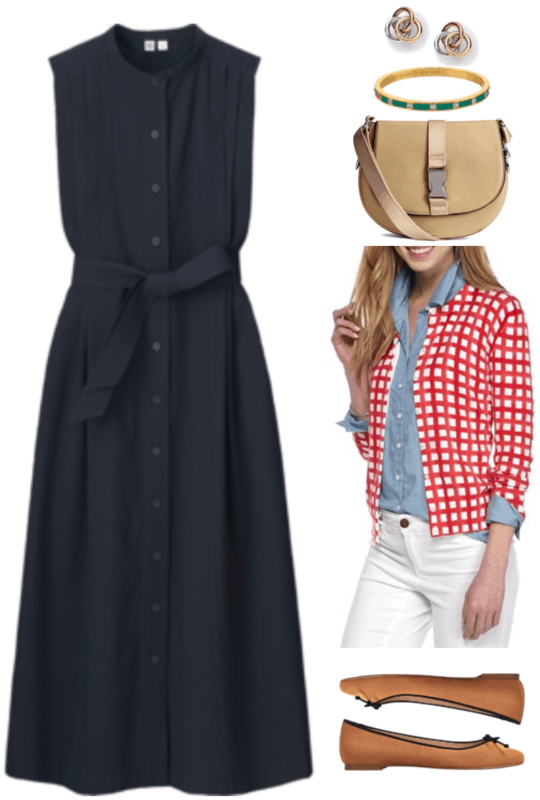 While this outfit might look difficult to put together, it’s actually quite simple; all you need is a classic shirtdress, a fun cardigan, some simple flats, and a few preppy accessories to finish off the look! Now let’s break this outfit down: I chose this navy midi shirt-dress because not only does its neutral navy blue color make it extremely versatile, but its longer length and slightly fuller skirt also makes it look more mature. The dress’ more modest silhouette also makes it easy to sit or move around in. Since the dress is on the conservative side, I’ve decided to pair it with an adorable red-and-white printed cardigan that balances the look by bringing in some fun. In terms of jewelry, I’ve chosen this preppy green enamel bangle to add a further pop of color to the look, and a chic pair of tri-tonal circular link earrings to add even more visual interest. To finish off this classy and sophisticated look, pick a simple pair of caramel-colored ballet flats (I love the black detailing on these ones!) and a cross-body bag with a subtly sporty buckle detail. 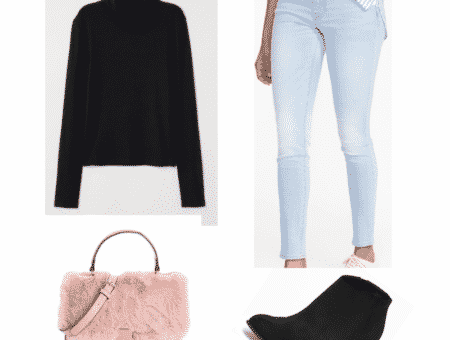 Now let’s take a look at something on the more casual end of the spectrum: This outfit combines various pieces that you might wear on an everyday basis — i.e., jeans, a loose-fitting top, a cardigan, and ballet flats — but in a way that is still put-together enough for work. Since this look already has a casual, fun vibe going for it, why not experiment a little with your jewelry and accessory choices? I love the colors of these pretty floral crystal earrings, as well as the uniqueness of this coral chain-and-thread bracelet! This outfit is actually quite similar to Outfit #1, except that I’ve switched out the cardigan for a blazer, and the chinos for colorful trousers, keeping the fun element alive. Furthermore, all of the pieces in this outfit, while different on their own, come together to form a streamlined and cohesive look. A chambray blouse with ruffles is a great starting piece, since it’s the perfect mix of girly and tomboy — kind of like this whole outfit! Next, tuck the blouse into a pair of cute rosy-red pants, and add a belt in a neutral color to pull the two pieces together. You could easily leave this outfit as it is, but if you want to add some more polish, throw on a blazer; I really like the stripes on this one, but a solid-colored one would work just as well! Since you have a good mix of colors, patterns, and textures going on here, keep jewelry and accessories to a minimum so as not to overwhelm the look: I like the subtle sparkle of these crystal trio earrings, while the pale gray color of the bag adds some lightness to the look. Lastly, you can’t go wrong with a pair of black d’orsay flats, and the ties on this pair add a little extra something unexpected. And there you have it — four looks that strike the perfect balance between serious and mature, and fun and youthful! 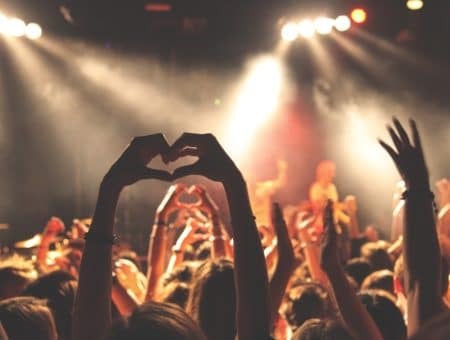 Thank you for your question! Have you ever had to dress for two different jobs in one day? How did you handle it? How do you strike the right balance between playful and professional? Let me know in the comments!